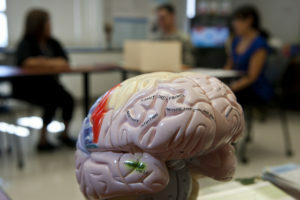 Traumatic brain injury can cause serious, chronic conditions, such as depression and thinking and memory problems. Researchers reported in a new study that these aftereffects can be minimized by using a neuron-targeting nanoparticle in an animal model, according to a news release from the American Chemical Society. The American Chemical Society is a nonprofit organization of 157,000 members, which provides chemistry-related research through its multiple databases, peer-reviewed journals, and scientific conferences. In brain injury, the damage does not begin and end with the blow. The injury can cause a cascade of after effects, such as inflammation and the death of brain cells, and lead to cognitive and physical condition that can last for years. Researchers are trying to figure out a way to stop this chain reaction. One promising approach is giving short stretches of RNA to the injured part of the brain that can help shut down the chain reaction. However, it is hard to get the RNA to the damaged part of the brain because of the blood-brain barrier, separating blood circulating from fluid surrounding brain cells. Sangeeta N. Bhatia and colleagues at the Massachusetts Institute of Technology’s Institute for Medical Engineering & Science aimed to see if they could rush RNA to brain cells after injury while the blood-brain barrier is still weak. The team, led by postdoctoral researcher Ester Kwon, created nanoparticles that would target neurons. They also put a strip of RNA into the nanoparticles designed to slow down the production of protein associated with neuronal cell death. The researchers gave the nanoparticle to mice intravenously. When they did so within a day of having a brain injury, the nanoparticles left circulation and accumulated in damaged tissue. Also, researchers found that the protein they were trying to reduce that was associated with neuronal cell death dropped by 80 percent in the animals’ injured brain tissue. However, this study has limited practicality since the diagnosis of brain injury or concussion is often missed or diagnosed days later. The research was funded by the Marie D. & Pierre Casimir-Lambert Fund, the David H. Koch Institute for Integrative Cancer Research at MIT, the National Cancer Institute, the National Institute of Environmental Health Sciences, the Defense Advanced Research Projects Agency and a Ruth L. Kirschstein National Research Service Award.